To the delight of all Team Emarkable.ie a recent digital marketing project CIFJobs.ie launched by our client CIF (Construction Industry Federation) to promote job search in the construction industry in Ireland, has made an appearance in the Financial Times (Dec 17th, 2016). 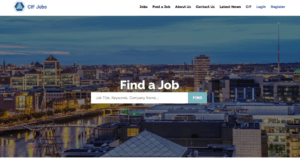 CIFJobs.ie, a website devoted exclusively to advertising jobs in the construction industry in Ireland,h as been launched to encourage construction workers, who emigrated during the financial crisis leading to a decade when almost no new homes were built, to come home. 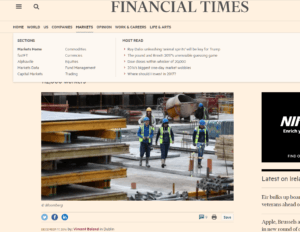 Now that the crisis in construction is finally easing, and the capacity for job building is beginning to show a mass of green shoots, the CIF tasked Emarkable.ie to build a user-friendly, all in one-stop easy job advertisement platform for employers in the construction sector. Job postings become available within 24hours of being submitted to the CIF, and the prospective applicant can apply immediately to the job posted. Job postings are representative of all construction sector roles. The postings include job titles such as: Project Quantity Surveyor, Site Manager, Junior Site Civil Engineer, Senior Site Civil Engineer, Electricians, Plumbers, Roofers, Carpenters… Prospective applicants can search the site on the homepage for all jobs listed under their keywords. For example, if a prospective applicant searches for ‘Electrical Project Manager Cork’, they will be given an automated list of all jobs with those search terms posted to CIFJobs.ie from all Irish employers with jobs available in C ork. More details relevant to the job specification are then outlined once the prospective applicant clicks on the job postings of most interest to their search criteria. Once they upload their CV and Cover Letter their application is on the way to their employer of choice.The CIF estimates that 137,000 people work in the construction industry in Ireland, compared with 273,900 at the height of the construction industry’s boom in 2007, and 96,300 at the lowest point of the building industry’s collapse in 2013. The CIF have forecasted that 112,000 more construction industry workers may be required to stabilise new housebuilding and infrastructure projects up to 2020. It is anticipated that the CIFJobs.ie jobs board platform will go a long way in facilitating the return to work for skilled construction workers who have lost out during the building downtime years, both in Ireland and abroad.